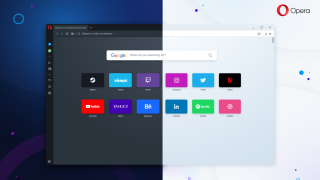 Opera Software has launched a new version of its desktop browser and it's something a little outside the norm. Opera Reborn 3 (aka Opera 60) comes with a built-in cryptowallet, a free unlimited VPN, and a Web 3 explorer for accessing blockchain apps. Reborn 3 also retains all the handy extras that make it stand out from most mainstream browsers, including a built-in ad-blocker, the ability to send links, videos and notes to other devices via Flow, a currency converter and a raft of customization options. "The web has transformed our lives. We are now continuously online. But the more time we spend online, the more we need tools that help us control the security and privacy of our digital lives," said Krystian Kolondra, executive vice president at Opera, head of browsers. The company has released a video to demonstrate all the new features of Reborn 3, which you can watch below. Opera added a cryptocurrency wallet to its Android and Windows browsers last year, avoiding the need to install a separate app or extension for the purpose, and has now rolled the feature out across all desktop operating systems. You can use your phone's own security features (including fingerprints and facial recognition) to sign transactions, and all transactions sync between devices. Opera says it will be adding the wallet to its lightweight Opera Touch browser soon. The free VPN made its first appearance in Opera for Android last month. It's easy to activate, requiring just a couple of taps, and keeps no logs of your online activity.